“We’ve been here a year and a month and I’m not sure where all the switches are,” said Tom Short as he turned on and off different lights, not knowing which switch turned on which light. As far as the home of Tom and Sue Short is concerned, the location of the light switches is the greatest of their worries. Theirs is a warm, inviting home located on a 60-foot lot overlooking Pleasant Lake. It’s not a summer retreat, although it could be; it’s their custom-built dream home. They had built once before. This time was a little bit different. The land they built this home on is special and has strong familial ties. At one time, it was where an old cottage stood that belonged to a friend of Sue’s mothers. “The land had been in the family for quite a few years,” said Sue. She explained that her mother had visited the cottage with her friend since the time she was 12-years old. They were best friends and after she was married, her friend gave her the land. Now, Sue and Tom have become part of the history by building their own home where the cottage once was. The piece of land is long and narrow, with the far edge a shoreline to Pleasant Lake. When the Short’s first considered building on the property, they weren’t sure if it was going to be possible because of the lay of the land and the necessity of adhering to certain building codes and regulations. 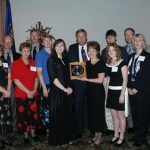 They contacted Thelen Total Construction, Inc. located in Elkhorn and soon, their worries were put to rest. The Shorts spent a lot of time getting ideas of what they wanted their home to look like. During the planning and design stages, they visited Parade of Homes and also looked through magazines. “So many of the stores have show rooms to get lots of ideas,” said Sue. They also took suggestions from Thelen. Having a contractor that they trusted was key to the Shorts positive home building experience. Every step of the way, Thelen was present to help Tom and Sue visualize what their new home would look like. By knowing the Shorts so well, Thelen was able to create specialties that would fit their desires. For example, in the kitchen, there was extra space at the far end of a row of cabinets. Instead of closing up the space, a tall, shallow rack was built in the cabinet where they could store their spices. When they open the cabinet, the spices are lined up and orderly rather than in disarray. It allows them the convenience of not having to dig through a deep cabinet filled with various spices. Also in the kitchen are deep drawers along the side of the island where they store all of their pots and pans. The space is easily accessible and doesn’t require a lot of digging and sifting though of cabinets to find the right pot. The sub-garage is underneath the existing garage. It’s much like the idea of a crawl space only much more vast and spacious with lighting and a door that leads outside. “This is just ground. There’s not a lot of difference in price to have it excavated to make it usable,” said Tom. The sub-garage is another example of how Thelen Construction made the most of the available space for the Shorts. Space was one of the tricks to the building of the house. The property is only 60 feet long and there wasn’t much width to build upon. The Shorts didn’t want a home that resembled a bowling alley. Because Randy Thelen is knowledgeable of building ordinances and laws, the home was categorized as a substandard lot. This gave the builders 40 feet of property to build upon rather than 30 feet of property, and when you’re building a new home on property where every foot counts, knowledge like Randy Thelen’s is invaluable. “He did a nice job,” said Sue. Tom is impressed with the work, as well, down to the wiring and insulation. “The mechanicals are well hidden. There are two furnaces, one at each side. Two 50-gallon water tanks and the water system is a new ionic treatment, and softener,” he said. “It eliminates having to use 2×6 construction because it insulates as much as 6 inch fiberglass in 4 inches so after the first level, you can go to 2×4 construction and save on that,” explained Tom. “And it’s warmer,” said Sue. The building of a new home is an involved process. “It requires a lot of legwork. A lot of running around,” said Sue. She stressed how important it is to take samples of tile and carpet when going to choose colors in order to match things correctly. But, she said, be aware that what you have chosen will probably look different in your home because the light is different. “They [Thelen] have recommended vendors and you could go through any of them or all of them. They were very helpful,” she added. With regard to light, windows and window coverings are also something to consider. The Shorts soon realized that after installing large windows in a new home, it is difficult, and almost impossible to find blinds for them. Large windows mean a lot of heat coming into the room. Sue suggested humorously that anyone building a home should take a seminar on blinds and windows. With beautiful surroundings inside, it was only fitting to have landscaping that matched. 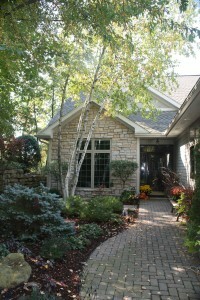 The Shorts chose Rustic Road in Burlington to do the landscaping of their home. Because of the slopes and hills on the property, the landscaping was no easy task. Water collection was key. Everything that came off the roof and the hill had to be collected. But with expertise and precision, the home is protected from water damage. The Shorts have a lovely, green backyard filled with plants and foliage, some which come from as far as Oregon. Now, a year a half after moving in, Tom and Sue look back on their experience and have nothing but positive things to say. Their home is an expression of who they are. It’s the comfortable place that their children can come home to when visiting from out of town. It’s the summer spot; with an extra bed and bathroom, full kitchen, living area and of course pool table, in the basement, relatives and friends can come by for summer enjoyment. It’s a luxurious home, as well, created with a sense of lifestyle and personality. And, the dogs like it, too. Not only because they have their own bathtub in the basement but they get to sleep in the upstairs corner bedroom. That’s the one with the best view.